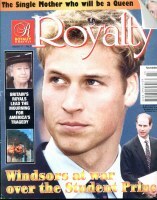 Vol 12 #9: The British Royal Family, Divorce for Charles and Diana(8 pgs), Princess Margarita of Romania(6 pgs), Death of King Baudouin of Belgium........a look back(8pgs), A Look Back at Prince Baudouin(4 pgs), Queen Fabiola of Belgium....the woman who made the sad king smile(6 pgs), Victor Emmanuel of Italy(6 pgs), Royal Wedding Of David and Serena(12 pgs), Queen Mary of Great Britian(8 pgs), and so many more Royals. 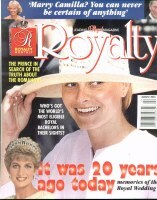 Mag has a small rip at binding and creases along binding. 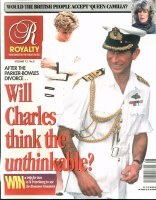 $8 (2 ISSUES AVAILABLE). 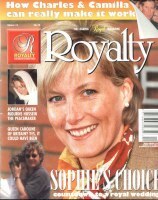 Vol 13 #8: Lady Helen Taylor, King and Queen of Spain, Queen of Sweden, Prince Charles, Queen Beatrix and Prince Claus of the Netherlands, Captain Peter Townsend, Queens of Belgium, Royals of Monaco and Spain, Willem Alexander of the Netherlands, Restoration of Windsor Castle, Charles and Camilla, Palaces of the World, and so many more royals. 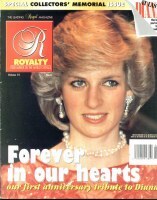 $7 (2 ISSUES AVAILABLE). 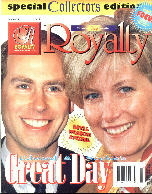 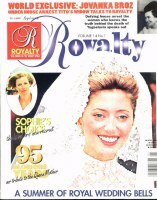 Vol 14 #1: A Summer of Royal Weddings(Pavlos of Greece and Marie-Chantal Miller, Princess Stephanie of Monaco and Daniel Ducruet, and a royal wedding in Portugal), 95th B-day of the Queen Mother, Diana, Princess of Wales, The Windsor Women, Princess Margaret, Pics of Anne Frank, Peter of Yugoslavia and Alexandra and so many more royals. 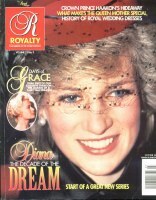 $10 (2 ISSUES AVAILABLE).